How 5 activists stopped the flow of Alberta Tar Sands oil into U.S. They pulled off the most expansive, coordinated takeover of fossil fuel infrastructure ever attempted in the U.S.
Leonard Higgins was starting to panic. The industrial chain he was attempting to cut loose was made of case-hardened steel. It was thicker and more durable than chains he’d practiced breaking in preparation for this moment. As he strained to pull the handles of the 40-inch bolt cutters toward one another, he was running out of time. The muted glow of daybreak had already begun to spread across the rolling plains of north-central Montana’s Chouteau County, revealing the snow-speckled farmland that surrounded him. Temperatures hovered around 30 degrees Fahrenheit, but the 64-year-old was working up a sweat. Now retired, Higgins had spent 31 years working as a project manager for various state departments in Oregon, including for the Department of Revenue and the Secretary of State’s Office. But on the morning of Oct. 11, he was attempting to break into a remote enclosure that housed a block valve attached to an underground crude oil pipeline. The valve was just south of Coal Banks Landing, an old steamboat stop along the Missouri River. The plan was to manually close the pipeline, an illegal and risky maneuver. Leonard Higgins sits outside his girlfriend’s Southeast Portland home Nov. 17. Higgins faces up to 10 years in prison for his part in the shutdown of five oil pipelines in October 2016. After what seemed like an eternity, he broke though one side of a link in the chain that held the enclosure’s gate. But instead of relief, his panic grew. Other chains had fallen apart once severed, but this one remained steadfast. As Higgins put all his might into repeating the battle on the other side of the link, a 22-year-old activist from Seattle, Reed Ingalls, held up his smartphone, live-streaming the break-in on Facebook. A documentarian, who Higgins won’t name, was also filming on site. Higgins knew 10 minutes had passed since the first call was made to Spectra Energy Corp., warning that a block valve on the company’s Express pipeline was about to be closed. He had to get inside the fenced enclosure and manually close the valve before sheriff’s deputies arrived. If he got arrested before he was able to complete his task, it would blow an operation that had taken months of research and scouting missions to plan. The chain finally gave way, and Higgins ran to the valve where he cut through a second chain, this time with ease. He began to turn a spoked wheel attached to metal housing and a network of pipes protruding from the gravel beneath his boots. He watched an oil-flow meter as he spun the wheel clockwise. After 40 or 50 turns of the wheel, the needle indicating the volume of oil flowing through the pipe hadn’t budged. Higgins looked below the meter and discovered a dial with settings that read “remote” and “local.” He pressed the dial and turned it to local, and that’s when he heard a motor begin to run. The needle on the meter began to drop. He had done it. He had closed the emergency block valve. That morning, Higgins was one of five climate activists who pulled off the most expansive, coordinated takeover of fossil fuel infrastructure ever attempted in the United States. Over the course of one hour, Higgins and his four counterparts stopped the flow of Alberta Tar Sands oil over the Canadian-U.S. border. Calling themselves “Climate Direct Action,” the group of activists also released an open letter to President Barack Obama that morning, asking that he invoke the National Emergencies Act to keep the pipelines closed. They chose Oct. 11 because it was an International Day of Prayer and Action, the last of four such events to raise awareness of the Standing Rock protests of the Dakota Access Pipeline. 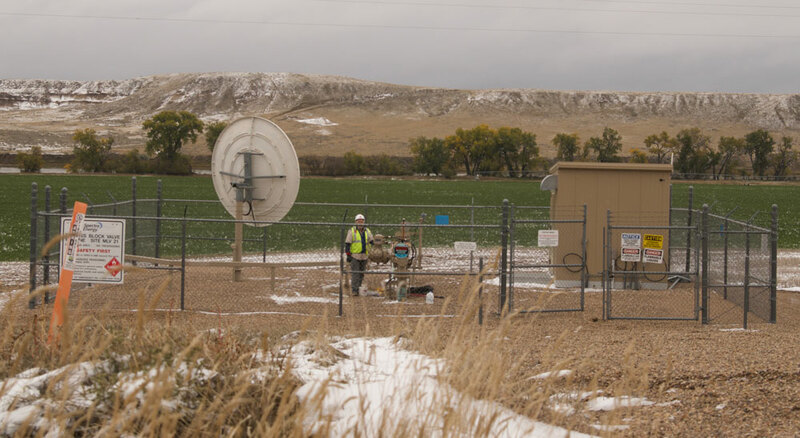 Leonard Higgins works on closing a block valve on Spectra Energy Corp.’s Express pipeline in Montana. The operation began at 6:30 a.m. Pacific time at the “communication center” in Seattle, where Jay O’Hara, a prominent activist and co-founder of the Climate Disobedience Center, began placing calls to the pipelines’ operators. First, a call was placed to the oil distribution firm Enbridge, warning its employees that in 10 minutes, two activists were going to shut down Pipelines 4 and 67 in Leonard, Minn., where they had pinpointed a location housing block valves to both lines. The warning calls were made to give each company the opportunity to close its pipelines remotely, following proper safety protocols that would be less likely to cause damage. Four supporters, one at each site, live-streamed the activists on Facebook as proof that they were on location and prepared to shut the valves. A second warning call was made by activists on location to the emergency numbers that were posted on site, giving the control centers one last opportunity to shut the valves remotely before they broke into the enclosures to manually shut down the pipelines. The activists, now known as the Valve Turners, each wore a hardhat and reflective vest – the required safety equipment for entering the enclosures. They all carried industrial bolt cutters, along with a chain and padlock they would use to lock the valves closed once they were shut off. 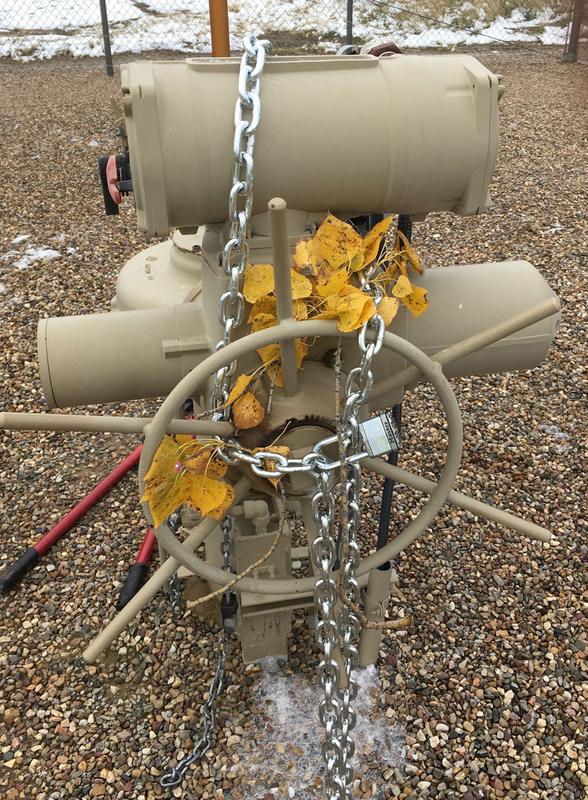 After closing the valve on Spectra Energy Corp.’s Express pipeline in Montana, Leonard Higgins chained and locked it in the off position. At approximately 6:45 a.m., Enbridge remotely shut down its lines in Minnesota, just as two activists from the Seattle area, retired attorney Annette Klapstein, 64, and freelance writer and editor Emily Johnston, 50, were beginning to close the two valves manually. It was the only company to shut down the lines remotely. Fifteen minutes later, a mental health therapist from Seattle named Michael Foster manually shut off TransCanada’s Keystone pipeline in Walhalla, N.D. He had to use the weight of his body to crank the giant wheel, bringing him close to exhaustion. Next came Higgins, who, despite his struggle with the chain, was able to shut off Spectra’s pipeline close to his 7:15 a.m. target. Lastly, in Anacortes, Wash., Ken Ward, a 59-year-old from Corbett, Ore., who’s spent most of his career working for major environmental and public interest organizations, manually closed Kinder-Morgan’s Trans-Mountain pipeline at 7:30 a.m.
Each closure was followed with a live-streamed statement from the Valve Turner, explaining why he or she felt a need to take matters into their own hands. Higgins had plenty of time to leave the enclosure before law enforcement arrived if he had wanted to. He and Ingalls both said it was at least 45 minutes before two Chouteau County Sheriff’s Office deputies, who’d been summoned by Spectra Energy Corp., arrived on the scene. He showed the deputies the bolt cutters and broken chains, and he explained what he had done and offered a brief explanation of why. He said he wasn’t trying to defend his actions – it was neither the place nor the time for that. Leonard Higgins is escorted from the site of Spectra Energy Corp.’s Express pipeline in handcuffs. He had shown the deputies the bolt cutters and broken chains and explained to them that he had shut off the pipeline's block valve. Trying to get away unscathed was never part of the plan. They saw Oct. 11 as the beginning of a “year of action,” as their battle in court would be just as important. What the Valve Turners didn’t predict was that six others – four supporters and two documentarians – would also be arrested and face felony charges. In Minnesota, Brooklyn-based climate fight documentarian Steve Liptay reportedly received criminal charges in the mail, and in North Dakota, Emmy Award-winning filmmaker Deia Schlosberg was arrested onsite and charged with three conspiracy-related felonies. Schlosberg faces up to 45 years in prison for filming the action, although she asserted in a video for The Real News Network that she had no part in planning the event and was standing on public property while filming. While the unnamed documentarian with Higgins was questioned and released, Chouteau County sheriff’s deputies arrested Ingalls, Higgins’ supporter, after questioning and releasing him twice. Ingalls, an environmental-studies major at University of Washington, said he was about five miles outside of Fort Benton, Mont., when he was pulled over and taken into custody. He and Higgins traveled to Montana together in a rented Ford SUV after meeting with the other Valve Turners and supporters at Johnston’s Seattle home to finalize plans on Oct. 9. The two rented a room at Pioneer Lodge Motel in Fort Benton, and they drove up the highway and a couple of miles down a gravel road the day before to time how long it would take to get to the enclosure. They didn’t want to get there too early, because hanging around could draw suspicion, and they couldn’t be late because the first warning call from Seattle was going to be made at 7 a.m. sharp. Higgins was charged with felony damage to property of critical public service and trespassing, and Ingalls was charged with aiding and abetting those activities. They could each spend up to 10 years in prison if convicted – the lightest sentences faced among the Valve Turners. In North Dakota, it’s the Valve Turner who shut down TransCanada’s Keystone pipeline who faces the harshest criminal charges. Foster could receive fines of $94,500 and a sentence of up to 81 years in prison – a life sentence for the 52-year-old. Higgins was living in Corvallis when he retired from state government in 2010. He had spent much of his career transferring burdensome government application processes, such as filling out unemployment applications and registering to vote, to online platforms. He said he always felt he was working toward the “greater good” but began to re-evaluate if he had made enough of an impact with his life’s work after his father died. At the end of his life, his father “didn’t have any sense of contribution,” Higgins said. He didn’t want to have that feeling on his own deathbed. In 2012, he founded the Corvallis chapter of 350.org and has been actively fighting climate change ever since. As the climate situation has worsened, his involvement in the movement has been increasingly brazen. In December 2013, he was arrested for blocking the transportation of tar sands extraction equipment through Umatilla when he and another activist locked themselves to trucks carrying the mega-load. Their action was part of a larger protest and plea from tribes of the Umatilla, Yakama, Warm Springs and Nez Perce to keep the more than 900,000-pound caravan from moving across their tribal lands. At age 61, it was the first time in his life that he had been arrested. 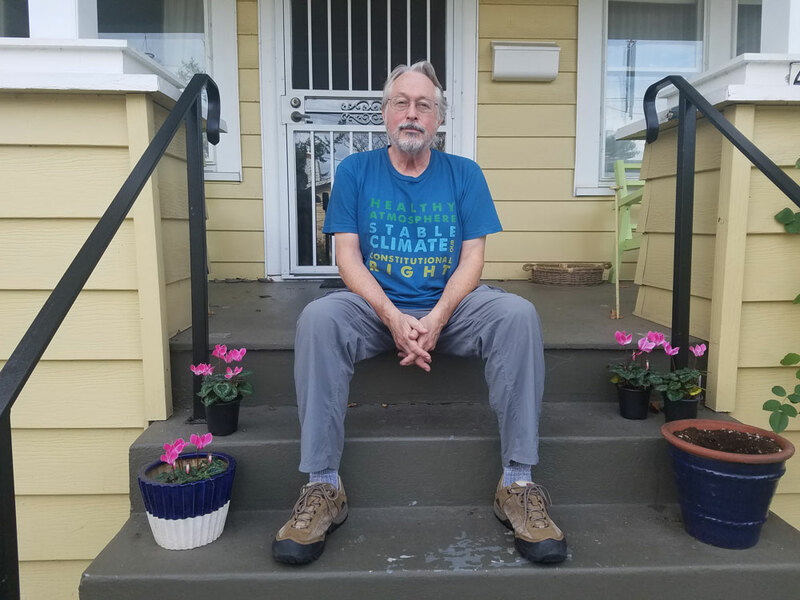 The following year, he traveled to New York for the People’s Climate March, and later he moved to Coos Bay, where he would stay for four months to fight the proposed liquefied natural gas export terminal that was eventually rejected by federal regulators. In May of this year, he was arrested with 51 other protesters for blocking railroad tracks leading to oil refineries in Anacortes, Wash. When the opportunity arose to shut down a pipeline, he didn’t think twice. These days, he splits his time between his hometown of Eugene and his girlfriend’s house in Southeast Portland, but planning the pipeline shutdown required three road trips spanning two weeks over the summer months. With little accessible information on pipeline routes, he had to get creative. 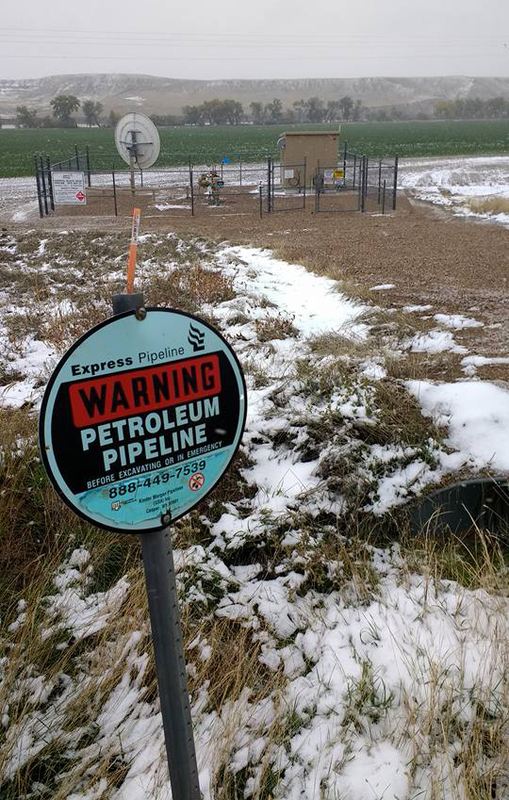 Spectra Energy Corp.’s Express pipeline in Montana. Federal regulations require that when a pipeline crosses beneath a highway, both sides of the road have to be clearly marked, he said. He said he also knew that if it ran beneath a body of water that was at least 100 feet across, there must be a block valve on either side of it so that the pipeline can be shut off in the case of emergency. He discovered each company’s block valves were manufactured to different specifications, with different shutdown instructions. They even met with a former pipeline safety inspector to discuss safety measures. Between 1999 and 2010, the Polaris Institute determined 804 spills occurred on Enbridge-owned pipelines. Additionally, the institute reported TransCanada was responsible for 152 spills from 2010 to 2015. A full business day passed before any of the pipelines were turned back on, the Valve Turners said. 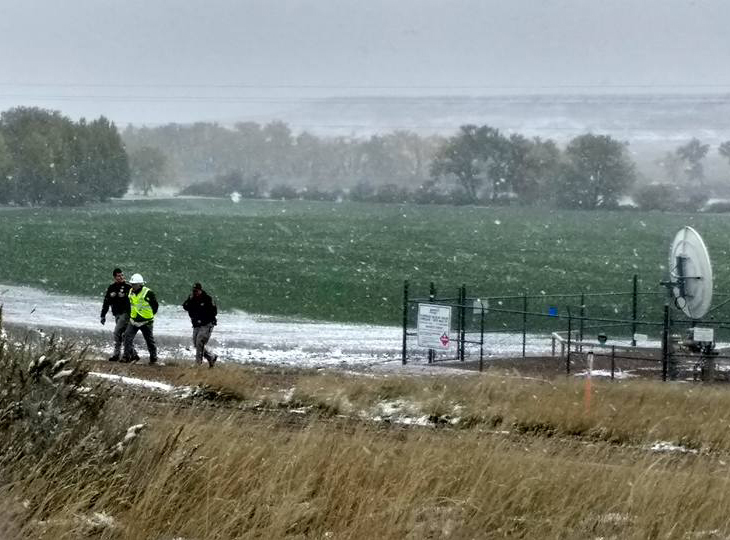 Although no one was hurt and no oil was spilled, industry experts and pipeline companies have released statements saying the Valve Turners’ actions could have caused significant harm. The plot to stop the flow of Alberta Tar Sands oil was hatched among a group of friends and fellow climate activists earlier this year, not long after they had all participated in the Break Free from Fossil Fuel events in Anacortes, Wash.
All five of the Valve Turners live in Oregon and Washington, and all had become increasingly frustrated with the failure of the U.S. government to take actions to steer the country away from the impending climate catastrophe. The activists wanted to escalate their actions. 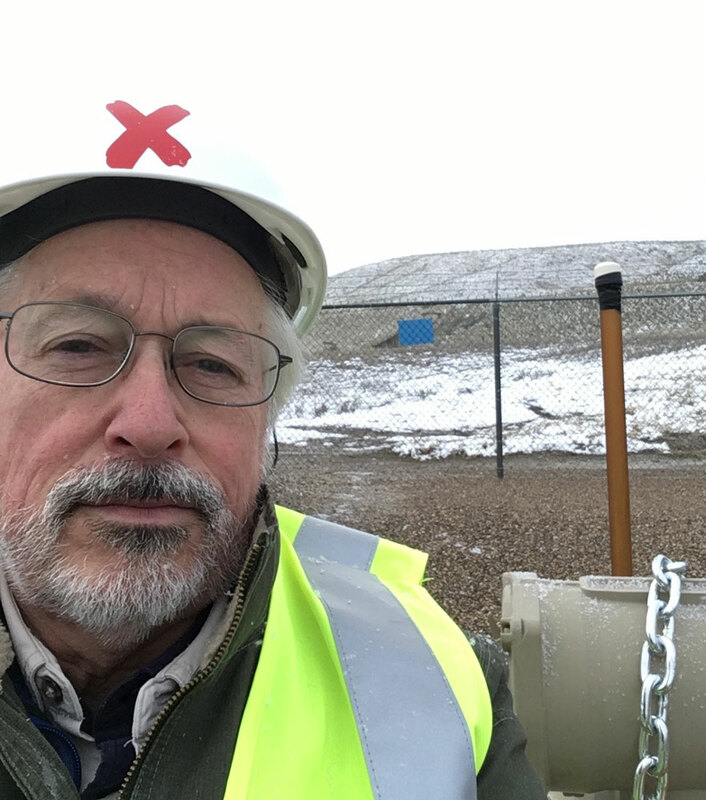 Leonard Higgins after he closed a block valve Oct. 11 on Spectra Energy Corp.’s Express pipeline in Montana. He said society’s overall complacency to the changing climate is an example of the bystander effect, famously demonstrated in Bibb Latané’s and John Darley’s 1969 experiment. The subject of that experiment was told to fill out paperwork in a waiting room. As they sat there, the waiting room slowly began to fill with smoke. Other people in the room had been told to act as if nothing was wrong. In each trial, the subject looked around the room to see if anyone else was alarmed, and upon seeing complacency, 90 percent of the time they did nothing. “It’s an emergency, and people are not acting as though it is an emergency, and so people don’t believe that there is one,” Higgins said. He and the Valve Turners hoped their actions would alert others to the urgent need to take action to roll back emissions. As an activist who’s been in the climate fight for some time as a member of the Seattle Raging Grannies, she said she feels she has run out of legal options. As an older retired person, she said it’s her obligation to put herself and her body on the line. Klapstein is facing felony charges punishable by up to 20 years in prison for her part in the pipeline shutdown. The Valve Turners’ desperation is at the core of their legal defense. Before they closed the valves that morning, they already had a plan for their criminal defense. They hope it will set precedent for other activists. Two law firms specializing in the representation of nonviolent activists are coordinating with the Climate Disobedience Center and defense attorneys in each state to put together a uniform necessity defense. Cooper Brinson is an attorney with one of those law firms, nonprofit Civil Liberties Defense Center in Eugene, which has represented more than 2,000 nonviolent, disobedient protesters since it was founded 13 years ago. Its primary client is Ward, who is facing up to 30 years in prison and $46,000 in fines for shutting down the pipeline in Washington. First, the defendant must show they were facing “serious, imminent danger or harm,” he said. With a lineup of climate scientists and other experts they hope to pull from for testimony, they believe they can prove that climate change poses that threat. Second, they have to show that they believed the action they took would avert that danger in some capacity. The Valve Turners say that if the pipes they shut down remained off, it would put the U.S. on track with emission reductions that former NASA climate scientist James Hansen and current NASA scientist Pushker Kharecha say could help to avert climate change from leading to an uninhabitable Earth. FURTHER READING: The necessity defense: Does saving the planet require civil disobedience? Foster pointed out their recommendations alone may not be enough because climate change is an uncontrolled experiment. “But anything less than that amount is a crime against this generation and all life to come,” he said. If the necessity defense gets them off the hook, it will be the first time it has worked in a climate activist case in the U.S. The Climate Defense Project, a legal startup founded by a group of Harvard Law graduates, is working with Brinson’s firm on the Valve Turners’ defense. The Climate Disobedience Center, founded by several people involved in the pipeline shutdown, argues on its website that if the necessity defense can be applied to climate activists, it could be a powerful tool for change. But it has only worked for a climate activist once, in the United Kingdom in 2008. However, activists have been found not guilty for reason of necessity in the past for protesting nuclear weapons, CIA recruitment and apartheid. The Valve Turners, who are all out on bail, plan to take their cases to trial, coordinating with climate activists in each jurisdiction to hold events in conjunction with their court appearances. “We’ve been so careful not to appear as alarmists, I think that we’ve gone too far in the other direction,” Higgins said. 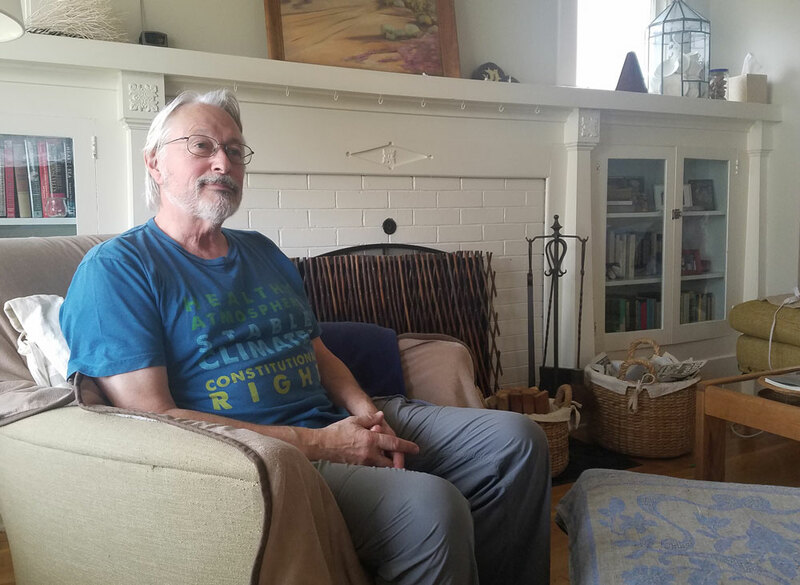 Leonard Higgins sits in his girlfriend’s Southeast Portland home shortly after having breakfast Nov. 17 with his fellow Valve Turners, the group of climate activists who shut down five oil pipelines in October. Higgins faces up to 10 years in prison for his part in the shutdown. Email staff reporter Emily Green at emily@streetroots.org. Follow her on Twitter @GreenWrites. Visit ShutItDown.today to learn more about the Valve Turners or to contribute to their legal defense fund.